Welcome to fall and to my first column in Landscape Management. 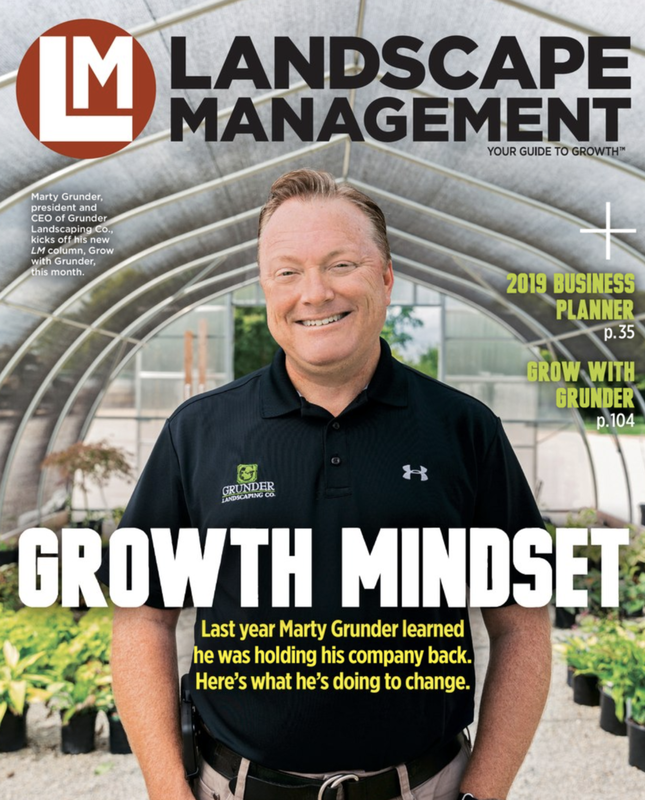 I will be here each month, sharing with you my insights as CEO of Grunder Landscaping Co. (GLC) and as a coach and consultant to ambitious landscape pros all over the country. I am always looking for ways to get better and grow as a leader and business person, and it’s my goal to help you do the same. So let’s get down to business. Whether you’re an owner or a team member, October is a pivotal month. With the hectic demands of summer starting to wind down, it’s the perfect time to look back at what you’ve accomplished so far this year and where you hope to finish, what you did well and where you came up short. We take the time to do this at GLC because it’s our last big chance to fix what we can for the season and to set ourselves up for success in the new year. We reassess every area of our business—from finance and operations to sales and marketing—but none is more important than the way we’re treating our clients and our people. Every successful landscaping company I know is working hard all year long to deliver great service to their clients, but fall is the time to wrap it all up with a bow. At GLC, we are taking extra care to ensure all our clients’ properties look exceptionally good and to get an extra touch point in with them before the year ends. This helps set the stage for us to convert design/build customers to ongoing maintenance clients, to lock in renewals and to sell new work for next year. Our team leads are knocking on doors to check in with our clients, our group leads are following up to make certain we haven’t missed anything and I am sending handwritten thank-you notes to all our clients and offering to personally walk their property with them. Any issues we uncover, we will investigate thoroughly and agree on a plan for correcting for the future. Is this time-intensive? Absolutely. But it’s worth it. We understand the lifetime value of our best clients and are striving to build lasting relationships with them. We also know happy clients are our best marketing tool, helping us to discover new prospects through their word-of-mouth recommendations to their friends and neighbors. Finding and keeping good team members is just as important to the success of your business as finding and keeping good clients. It’s also an ongoing challenge for nearly everyone in our industry. In my experience, the single most important approach you can take is to proactively build the kind of company and culture that people want to be a part of. And to do that, you have to actually listen to your people and their concerns. At GLC, we are holding “stay interviews” with our team members to find out what they like and don’t like about our company and what would cause them to stay or to leave. These can be scary conversations to have, but they can provide invaluable insight into how to improve your workplace and retain your best people. We are also sending our director of human resources, Amber, out to job sites to talk with our teams in the field and to gain a better understanding of the specific challenges they face. What do your clients and team members have to say about you? Now is a great time to ask.